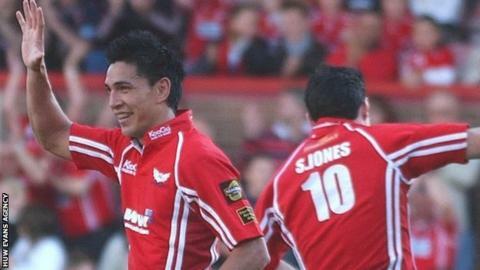 Stephen Jones' "picky" and "demanding" coaching methods can boost Scarlets' efforts in 2015-16, says Regan King. Jones is now backs coach to ex-team-mate King after joining from Wasps. "He's really picky about how we do things and if it's not done to his standards and if it's not done well, we'll do it again," said King. "And I think that's what we need. If we're going to get things right on the pitch, we've got to train how we're going to play." Once-capped New Zealander King hopes to return to his best from following an injury-affected return to west Wales head of the 2014-15 season. And he believes Jones can help bring the best out of the Llanelli-based squad. Jones joined Wasps as a player under their Welsh coach Dai Young in 2012, returning to the Llanelli-based region after Mark Jones departed last season. King said: "He seems to have gone away and grown as a person as well and he's very thorough in his preparation. "It is strange [to be coached by him now], but I have got a great respect for the guy. "And I'm sure all the young guys that came through watching the Scarlets they will have watched Jonesy and he's a legend at the club and at the region and with Wales." King says Jones has brought a "different mentality" on his return. "We buy into what he says because he's been there and done it," said King. "He was demanding as a player, but that's what draws the best out of everyone. "He's very particular about how he wants things done and that's how I want to be coached as well. "I want everyone to get the best out of each other and if it takes doing it 10, 12, 13 times, then that's what it takes until we get it right." And despite being a former team-mate of ex-British and Irish Lion Jones, King says no favours are on offer. "He's great with player management. He'll pull you to the side and have a chat to you," said King. "No-one's bigger than the team, whether you've played one season or 15 like myself. "If you're not doing it right, then he'll pull you up about it. And that's great. That's what we need."